Derosa sk Bike has 400km on it. Full dura ace 9070. Brand new aerofly 40 bar deda 110 superzero stem. Hed sl Ardennes wheels. Selling this 2018 Specialized Diverge e5 Sport. The bike is new, size 52. Great for gravel, commuter, road riding as well. Comes with Shimano Sora components, mechanical disc brakes, aluminum frame, carbon fork. 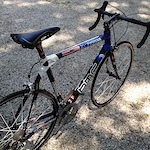 Suitable for people 5'6"-5'8"
Velo Vie veloce 100 triatlon bike. Shimano parts. 175 Cranks. Fulcrum 5 wheel set. Frame size is 51cm. Pedals are not included. Bike is in great condition and was just recently serviced. New chain, cassette, bottom bracket, cables/housing, bar tape and tires installed. It has a mix of Ultegra 6700 and Dura-Ace 7900.